Poetry reading is always cool. However, just decline the modern terminology which banners poetry as something hot - we are not letting the sensual lines on Instagram and Facebook take the pose as poetry! I only consider meaningful poetry to be the real poetry and today I am talking of a leading India's poet in English, Vihang Naik's collection - Making a Poem. Though the collection is old but he has republished it with the Authors Press publication and that's how I got to read this wonderful collection. I will share my thoughts on the poetry collection today. This is how the collection looks like. Making a Poem is about the poet, poetry and how these two complement each other. Vihang's way of succinct poetry is the hallmark of this collection and you will seldom find a poem crossing the 12-13th line. His poems are short, simple in words and complex in meaning and that's how he keeps the readers engaged. Coming to the meanings or interpretations, Vihang throws it vacantly into space. He has given his readers the full freedom to choose what they want to extract from his words and lines. Poems in the collection are divided - classified into five different sections and each of them has five poems. So, the poems are 25 in number but most of them share a common 'feeling'. The ephemeral world and the eternal world - the things what we see and the things we need to see. 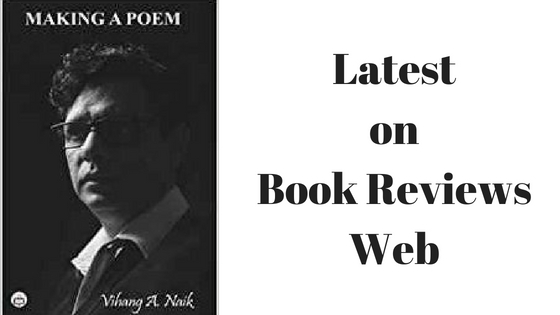 To conclude the review of Making a Poem by Vihang Naik, I can only add that the poems are very well-composed and they display the modern life which has mostly been taken over by a mark of hurry and dismay. You will find in his poems a tone of pessimism as well as a hidden zeal which inspires you to keep burning!